Finding a toddler-friendly method turned out to be quite a process. At first I thought I could get away with a baked chicken tenders technique. I dipped little chunks of chicken breast in egg and then in crushed, seasoned Corn Chex, then baked it. Rejected. I baked chicken chunks that hand been dipped in egg and then in seasoned corn meal. Rejected. I baked chicken chunks that had been dipped in egg and then in seasoned GF flour, then sprayed with cooking spray. Considered, but rejected. I gave up on the baking. Frying is not my strongest area of cooking expertise, but I tried it. I fried chicken chunks that had been dipped in egg and then seasoned GF flour. Considered, nibbled, but rejected. Start heating the oil so it will be ready when you are. If you have a deep fryer, feel free; I fill a large cast-iron skillet to a depth of a little less than inch and heat it on medium to medium-high heat. In a wide, shallow pan (e.g. a pie pan), blend rice flours, corn starch, potato starch and 3/4 tsp salt. Set aside. In another wide, shallow pan, whisk egg and water until well blended. Put the chicken, spices and remaining 3/4 tsp. salt in a food processor. Don’t bother removing any stray pieces of fat. Pulse in until you have an unappetizing chicken paste. Remind yourself you love your toddlers. 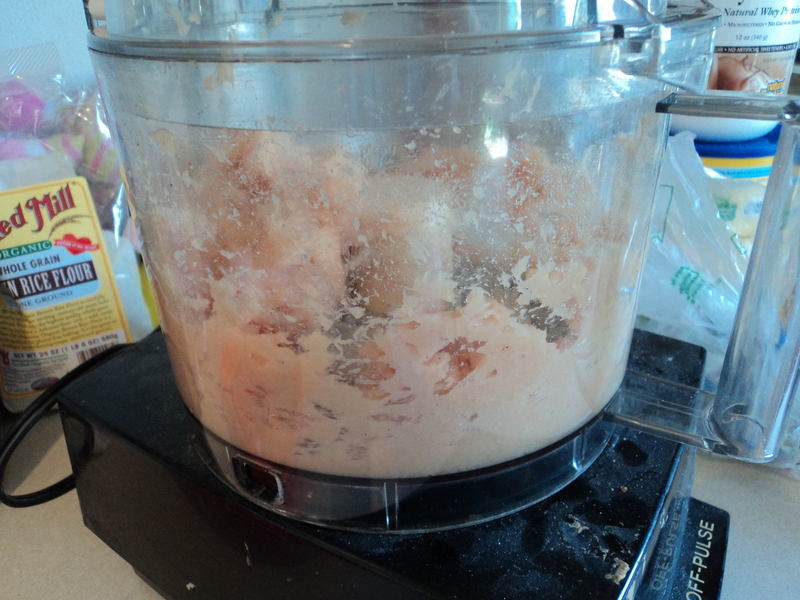 Use two teaspoons to scoop out small ovals of the chicken mixture. Make them smaller than you think you should and flatten them a bit. 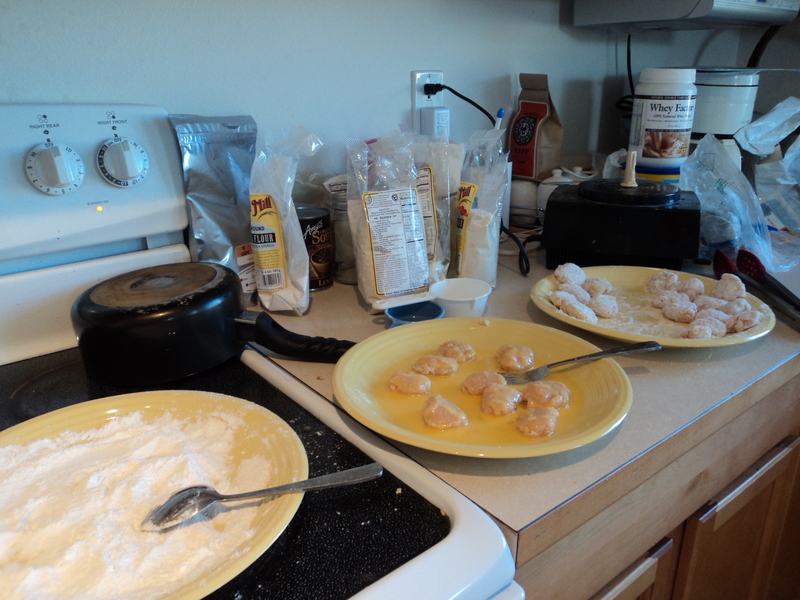 Coat each in the flour mixture, then dip in egg, then back in flour. Rest the un-cooked nuggets on a plate until you have used at least half the chicken. You can make the rest while the first half cooks. If you’re not adept at frying, you’ll want to do a practice nugget before you load up the pan. The oil is hot enough if it starts to bubble when you sprinkle a bit of the flour mixture in it. 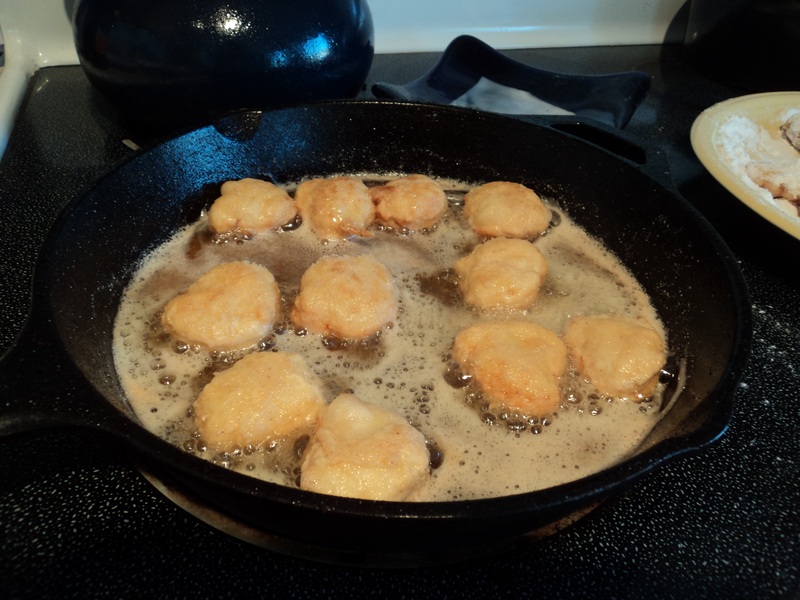 Depending on how big you’ve made your nuggets and how hot your oil is, it should take less than 2 minutes per side to get them golden brown and cooked through. Once you’ve cooked one and adjusted the temperature, you can cook several at a time–don’t crowd them too much or the oil may cool more than you want. While those ones cook, finish making and coating the last of your nuggets. Place on a plate lined with paper towels. They’ll stay plenty hot while you make the second batch. Serve with gluten-free dipping sauces, of course. 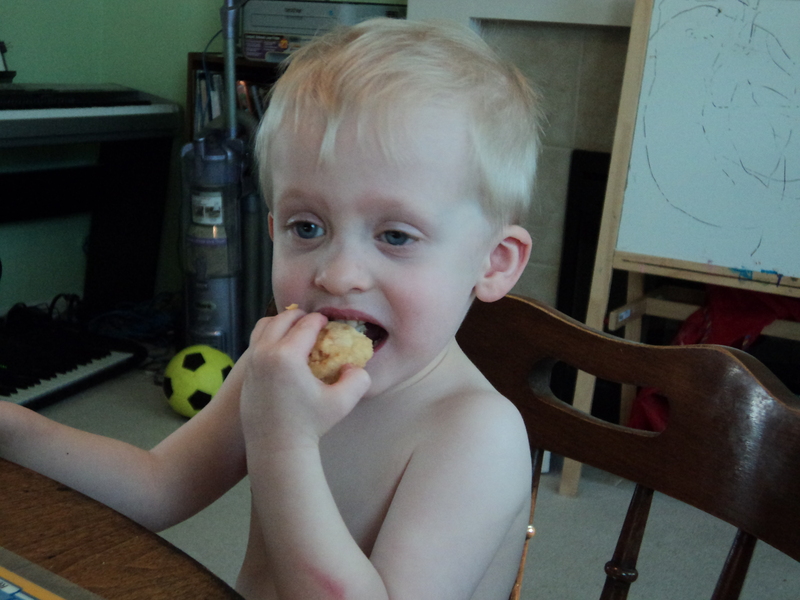 Makes about 35 nuggets/serves 2 adults and 3 hungry toddlers with enough left over for a lunch. * Plus, by making them myself I can control the quality of the ingredients. There are no fillers, no preservatives. I can use organic, local farmers market stuff or I can use the party pack from Safeway. I’ll probably do both, as time goes on. 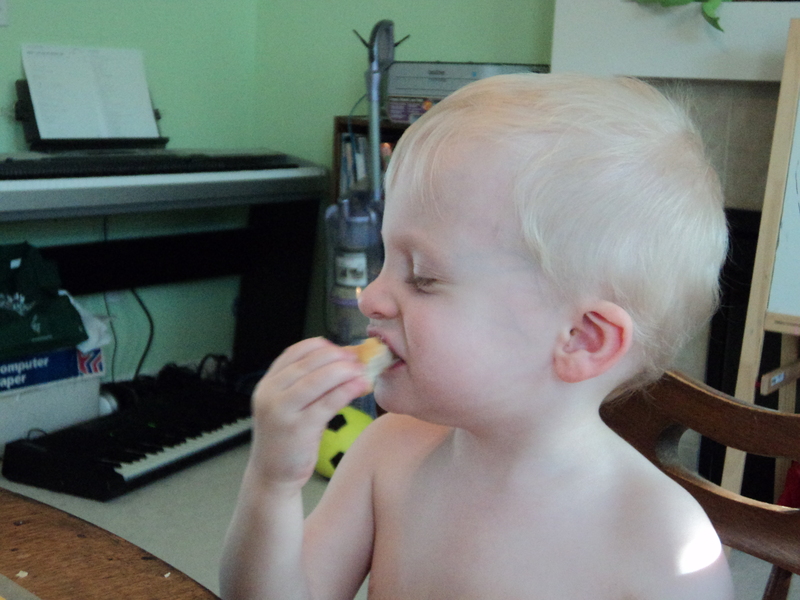 So our daughter has been eating entire chickens (or so it seems) every few days via my husband’s homemade chicken fingers – I know they’re not nuggets, but you could try cutting them in smaller chunks if you ever feel like giving your food processor a rest 🙂 Emma dips them in insane amounts of ketchup and loves them. Just regular chicken cut up and dipped in egg and Schar gluten free bread crumbs. Bake at 450 for 10 minutes on one side, then flip and another 10 minutes or so, depending on how much or if you like them slightly browned. Your declaration of chicken nuggets as the Holy Grail made me laugh to tears! My almost 3 year old is allergic to wheat, so I will try your recipe. One problem though, he is more allergic to eggs than wheat, so I will have to try to find an egg-free substitute for the batter.